As soon as fresh strawberries appear on the market, you can easily find them, buy them cheaply and there are many tasty treats that can be made by using them. There is a huge chance that you never even looked at a strawberry frozen yogurt recipe before. Most people are used to simply buying frozen yogurt from a store. With this recipe, you can actually do it yourself at home and using fresh strawberries makes the result even better. Before we tell you how to do the desert, you should know that it is recommended to eat it on the same day that you make it. If the frozen yogurt will stay in the freezer over 8 hours, there is a huge chance that it will get icy. You can add some vodka (a tablespoon is enough) or kirsch in order to make sure that the mixture will last for a longer period of time. 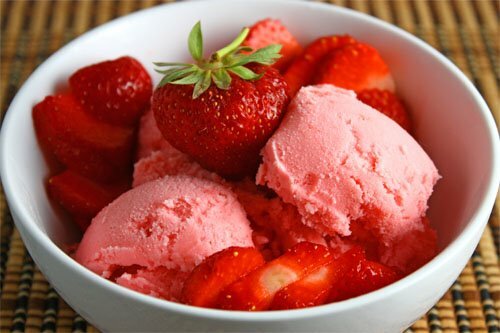 For this recipe you will need 3 cups of fresh strawberries that are sliced, 2 quarters of a cup to one cup of sugar (based on the sweetness that the frozen yogurt should have according to your tastes), 3 tablespoons of lemon juice, half a cup of whole milk, a quarter of a tablespoon of salt and 1 and a half cups of full fat yogurt. 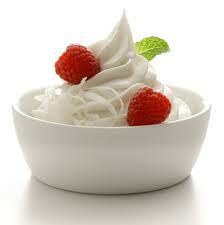 If you want to use non fat yogurt, you will also have to add 2 tablespoons of cream. Use a medium saucepan and add the lemon juice, sugar, salt and strawberries. Use medium heat and continue stirring until the sugar is completely dissolved. A potato masher is recommended to mash up your strawberries as you wait for the entire mixture to heat up. When the sugar is fully dissolved, remove your heat source and just let the entire composition to stir for around 10 minutes. Now you will need to take the yogurt and milk. Stir them till a mixture is obtained and put it in your refrigerator. You need to chill it for several hours, until it is completely cold. The last step of the strawberry frozen yogurt recipe is to process your mixture in an ice cream maker for around 20 minutes. Add the strawberry mix and you can start eating your frozen yogurt. If you do not want to, just freeze it until the time that you’re ready to serve it. Are There Any Alternatives To This Strawberry Frozen Yogurt Recipe? Simply put, there are many variations that exist at the moment. This is just one of the most popular recipes that people are using at home these days. You can basically add anything to the mix, according to your taste. The important part is to keep the milk and yogurt mixture as the base and to add anything you want to that strawberry mixture. Some people add chocolate while others will want to use low fat yogurt. At the end of the day, the choice is completely yours but we are sure you will love the outcome.